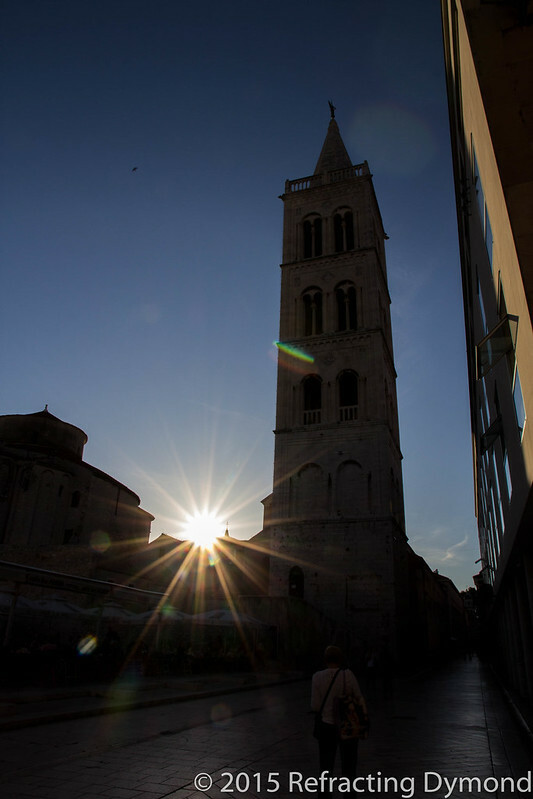 The Zadar Cathedral is a beautiful Romanesque building, built in the 12th and 13th centuries. I caught this beautiful sunset and had to wonder just how many sunsets this bell tower has seen. Thinking of the history this building has been through is simply amazing and makes me realize that we have just a very short time on this planet. I wanted to get the star effect on the sun, so I closed the aperture to f/16. I wanted the buildings to be in silhouette…even though they are beautiful and you don’t see the details, I wanted the shadow effect. I feel this really captured the mood on the street on this summer day in Zadar. Thank you. Zadar is beautiful!